Bakhriddin immediately embraced the idea of working with children and creating friendships. Tajikistan considers itself a secular state, with a Constitution providing for freedom of religion, but 98 percent of the population is Muslim. The first Adventists, Ivan and Vasily Kosmjinin, traveled to Tajikistan in 1929. Only 204 Adventists worship in Tajikistan. One out of every 39,215 people in Tajikistan is an Adventist. Believers are searching for new ideas to reach out to others in their country in practical ways, and God is opening doors. To Sabbath School teachers: This story is for Sabbath, Nov. 25. Click here for photos to share while telling the mission story. 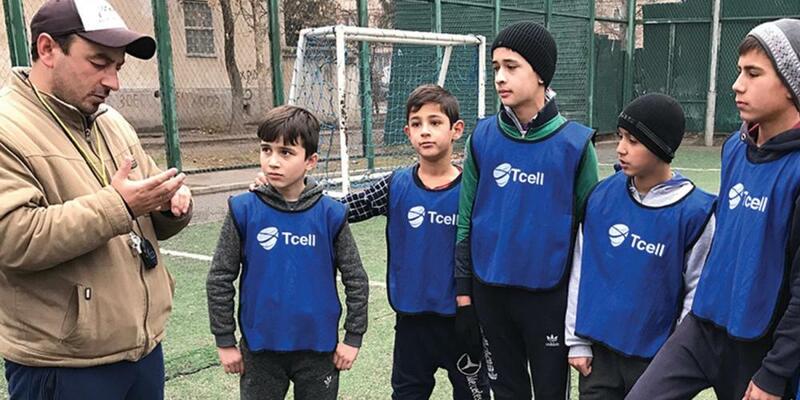 Neighborhood boys who play soccer under a Seventh-day Adventist coach in Tajikistan have more to worry about than yellow and red penalty cards. They also try to avoid the special blue card. The coach, Bakhriddin [bahk-RIH-dihn], flashes the blue card when he hears a player use profanity. If a player receives two blue cards, he is out of the game. Parents like the discipline that Bakhriddin demands of his soccer players. They have noticed that their children are helping them more at home because of the discipline they’re learning on the soccer field. The boys are swearing less and are not spending as much time playing computer games. The soccer team is part of an Adventist effort to reach out to neighbors in Tajikistan, a landlocked country in Central Asia that is predominantly Muslim. Only 204 Adventists live here. More than 1,000 church members left Tajikistan amid instability over the past decade. Church leaders say it is difficult to share Jesus because public evangelism is banned. But church leaders are hopeful after 18 people were baptized in 2016 as a result of prayer and outreach programs. Church leaders are working to develop more outreach programs, such as the soccer team. They are working to establish an English-language school, hold health and family expos, and support a small but popular bicycle club. These programs create opportunities to develop friendships with neighbors and contribute to the improvement of society. Part of this quarter’s Thirteen Sabbath Offering will be allocated for outreach programs such as the soccer team in Tajikistan. The soccer team plays on a field near the only Adventist building in Tajikistan’s capital, Dushanbe [doo-shahn-bay]. The team was formed in 2015 when neighborhood children saw Bakhriddin playing on the field and asked him to be their coach. Bakhriddin immediately embraced the idea of working with children and creating friendships that can extend to their parents. His project didn’t require a lot of expense—just three soccer balls, a whistle, and a stopwatch. Then he received certification from the Asian Football Confederation, the governing body of the sport in Asia, to coach children’s soccer. These days he coaches two or three matches a week. Fifteen minutes of every 90-minute training session is set aside for a moral lesson. The boys, ages 11 to 13, have quit using drugs and other harmful substances as they get involved in sports. No blue cards for profanity were flashed during a soccer match that Adventist Mission watched. The boys chased the white ball with determination as they played in light rain. They smiled widely whenever the coach addressed them. A half dozen boys watched the game, clearly wishing that they would be invited to play, too. Bakhriddin said the spectators would have an opportunity to join the team. After the soccer games, parents invite the coach into their home for tea and conversation. Please pray for the soccer team—not to win games, but to win hearts. And support outreach in Tajikistan and around the world with your Sabbath School mission offerings.